Ever since I started posting pictures of lunch boxes on my facebook page and then did a series about lunch boxes for adults here, I have been getting random queries about packing food in lunch boxes. All these queries may seem mundane but I knew the bottom line is the same. How to make the food stay fresh in the lunch box for 3-4 hours or more, it may be a challenge in the diverse climate we experience through the year. In summer there are chances of the food getting spoiled and in winters it may get too cold and dry, some foods get soggy when packed and some foods become chewy and inedible. Oh and some foods become smelly and they seem to get the smell of the food that you had packed yesterday in the same lunch box. While most of us figure out what foods will stay edible till the lunch or snack time, many of us stay clueless about the fact that it is the lunch box, its cleaning and maintenance that can affect the food in certain harmful ways. If the food gets smelly by lunch time, or gets soggy and tasteless, if the food leaks or stains the insides of the lunch box, you need to take care of a few facts about your choice of lunch box and how you clean and maintain them. 1. Use the most appropriate type of lunch box for your type of food to be packed. You need to eat a tasty filling meal for your lunch or even a snack so please take care to choose your lunch box rightly. There are specific lunch boxes for sandwiches, for curries, for salads, breads and crackers etc. If your kid brings back her food untouched it doesn't mean she is not interested in food. Most probably the food gets insipid by her lunch time or she finds it difficult to hold the food while eating. Some really nice sectioned lunch boxes may be the best for kids and adults like, choose the shape and size suits the requirement. 2. Choose good looking lunch boxes and water bottles if your kid is a fussy eater. It helps in most cases as they feel proud of what they bring. Most importantly, the lunch boxes should suit the type of food you are packing for them. A snug fitting leak proof lid is important if you are packing wet foods but if you mostly pack dry type of food you can easily choose cute hand painted steel dabbas too. Do not use hard brushes and abrasive cleaners if the lunch boxes are hand painted like the ones above. 3. Use appropriate brushes and soft sponges to clean the lunch boxes of all types. The detergent should be non abrasive because the abrasions become the breeding spots for bacteria and fungi that cause food poisoning and make the food spoil, get smelly etc. Some sectioned lunch boxes come with a superbly snug fitting lid that has the grooves lined with a delicate silicone cushion. These need more attentive cleaning as any food particles stuck to the silicone lined grooves make hidden breeding spots for pathogens. I have seen a young child whose IBS (Irritable Bowel Syndrome) symptoms were not being traced back to a definite cause but when the lunch boxes started getting cleaned properly her IBS got cured. Better be careful about the cleaning of your kids' lunch boxes and not leave it to the house help who may not be aware of the harm. 4. Do not reheat the food in lunch box for too long in the microwave oven. It is better to avoid reheating but do it quickly if you must, don't ever heat the food too much or for too long. 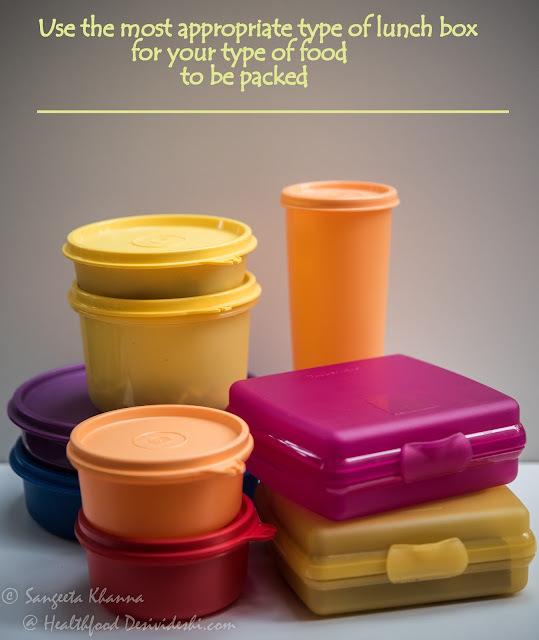 Frequent reheating in a wrong way can cause degeneration of the plastic in the even in the best quality plastic lunch boxes. Also, remember not to freeze food in the lunch boxes too frequently if you want your lunch box last longer and to prevent chemical leaching from the surface. 5. Pack some hand towels and tissue papers along with the lunch boxes not just to wipe hands after eating but to wipe the empty lunch box too. When you wipe the lunch box with a tissue after eating your food it becomes clean and dry enough to not let any bacteria or fungi breed in it till you reach home and get the lunch box cleaned. This works like a charm and we follow it diligently. The lunch box smells awful when opened for cleaning if not wiped dry with a tissue paper, so Arvind always follows this simple rule after finishing his lunch. 6. 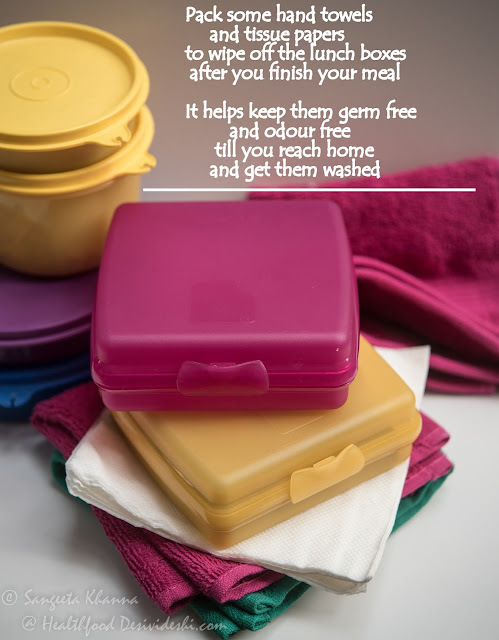 Clean the lunch box asap after reaching home as the waiting time increases the chances of germs breeding in them. The grooves in the lid make the lunch boxes more susceptible to germ breeding than other everyday use utensils. 7. 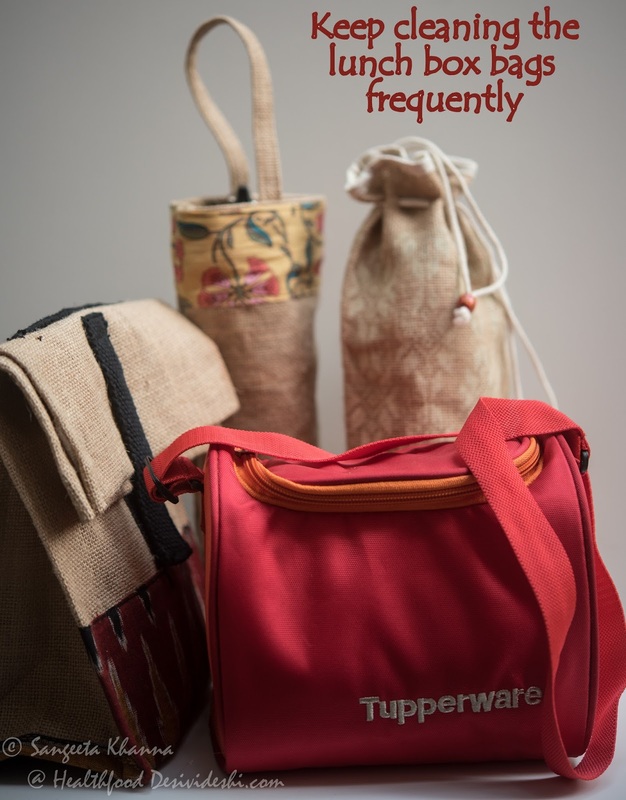 Rinse the lunch boxes with hot water if you pack buttery foods or coconut chutney, oily dips etc.Hot water wash is also needed if you pack foods with strong smells or flavors, foods that leave stains like curries and pickles. 8. Once a week get all lunch boxes dipped into hot water with vinegar and pinch of soda bi carb. It helps dislodge all odours and stains that may be clinging to the surface. Note that the cleaning brushes and sponges also need this treatment so clean them thoroughly to keep them germ free too. 9. 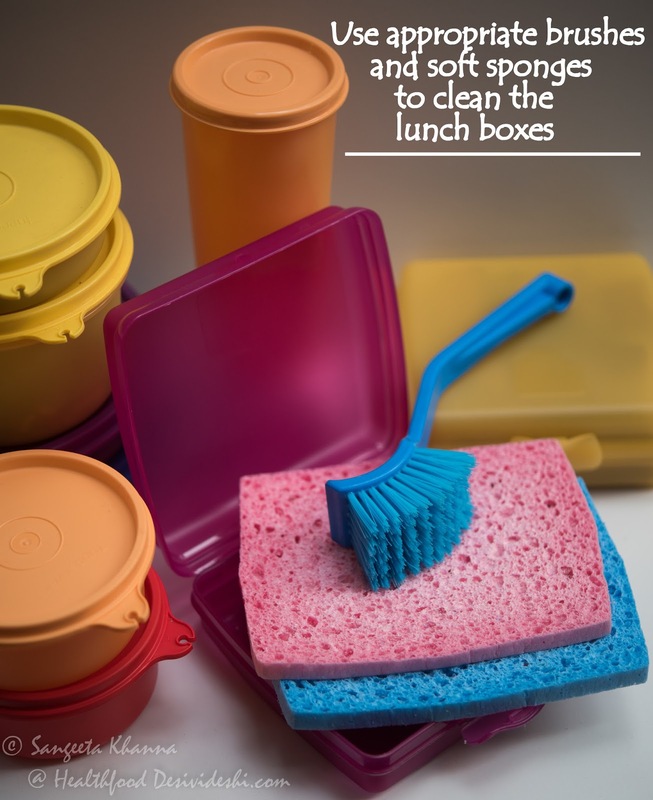 Get all the lunch box bags cleaned in a washing machine once every fortnight or as required. Use appropriate wash mode, most bags need a gentle mode and mild detergent. Sun dry them thoroughly before using them again. 10. Drop in a few dry orange rind or dry basil flowers along with the lunch boxes to keep them odour free. Do not use chemical De-odourants of any type for either lunch boxes or the bags meant to carry them. A pouch of silica gel can be slipped into the bag to keep it dry but be careful in case of children. Last but not the least, don't forget to comment, give you inputs, ask questions about these issues and enter a chance to this fabulous giveaway. 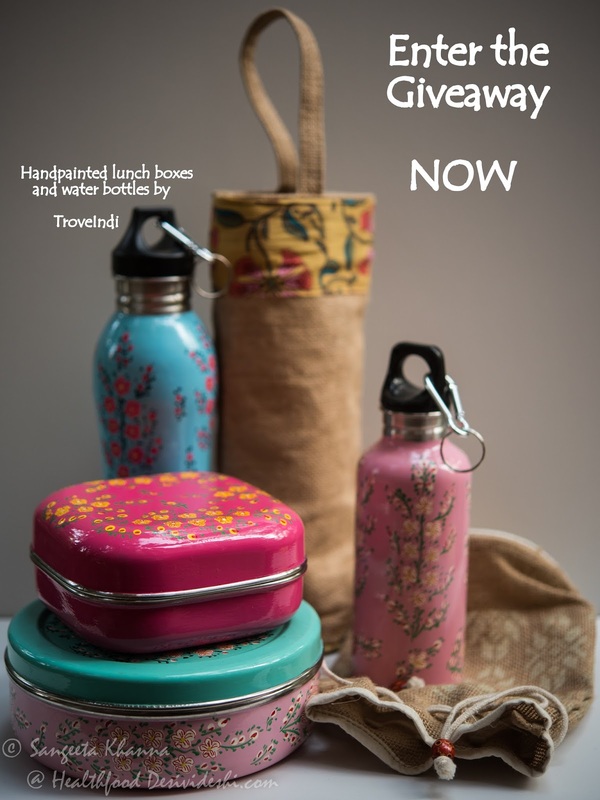 Please don't forget to leave your mail id or keep a tab on the upcoming blogposts about lunch boxes to know what you have won. There are some nice lunch boxes waiting to become yours. So tell me what do you do to maintain your lunch boxes? Did you find this blogpost helpful? Tell me what lunch box related queries do you have? I might include the queries and suggestions in the next blogposts, this series will continue till the end of the next month. Oh Sangeeta, I love those hand painted lunch boxes and water bottles...In our house we use glass containers(pyrex, quite popular here in states) for adult lunch boxes and for school lunches I use steel kind. For cleaning I prefer to hand wash any plastic lids & steel boxes but glass kind goes in dishwasher. Also most of the air tight containers have silicone gaskets in the lid, which can be taken out, always make sure to clean that too and let it dry fully before putting it back. 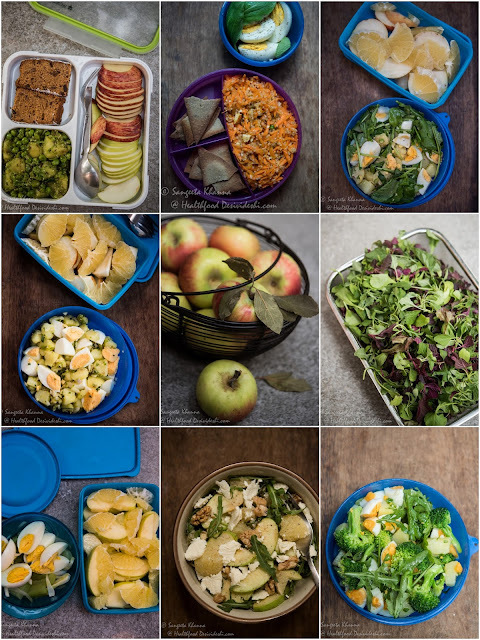 A very informative post about lunch boxes, bottles & ways to clean & maintain them.A very comprehensive post on what types of lunch boxes to use for varied types of foods et al. I wash my water bottles with soap & brush once a week. And lunch boxes daily. The suggestion of giving a weekly rinse of vinegar & soda bi carb is a gem of an idea.So also the idea of a hot water wash for dabbas used for oily food stuff. I am looking forward to the next blog post in this series. Beautiful lunch boxes. I use glassware as it is less "smelly" and for my kid, I throw away a plastic box after 6-8 weeks and get a new one. Oh myyyy!! !This makes me seriously happy. ! Eeekkkkkkk.e.I need these tips as packing my dabba is the favourite part of my day and i still struggle with it.Good job :)Also I have wanted these beautiful lunchboxes for the longest time. Well, today I guess the angels brought me here. Never underestimate the mystical powers of the universe .aw thank you universe!I'm totes crushing on your blog right now. This is no doubt an informative post.In all points I like that basil flower thing.I soak a cotton with some vanila essence and keep that in box.I wish to get that lovely hand-painted box :) They are so Beautiful. This is a great post...and yes, I also agree with some of the points listed here to be very effective. Another thing I do quite often is that I cover the lunch bowl with a cling wrap before putting up the lid. This helps in preventing the oil and grease from the gravy enter the nooks of the lid. This helps maintain hygiene as well. Hi Sangeeta, loved this post - It's informative and all your suggestions are so practical / doable ! That's what I loved about it :)All the Lunchboxes at our home are cleaned daily with soap and water , and depending on what's been packed , with warm water too. 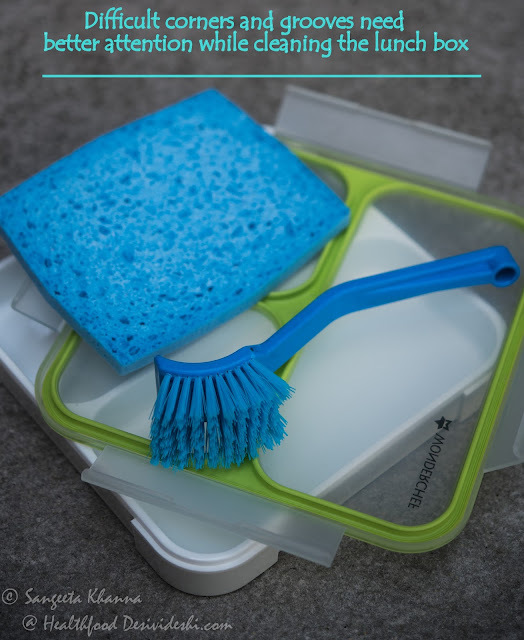 Also cleaning immediately is important and we discard plastic ones every couple of months given how plastic tends to retain the smells longer than the rest. I love the idea of using basil leaves / orange rind - will definitely give that a shot ! Thanks for the tip of orange rind or dry basil flowers... I wouldn't have thought of that. 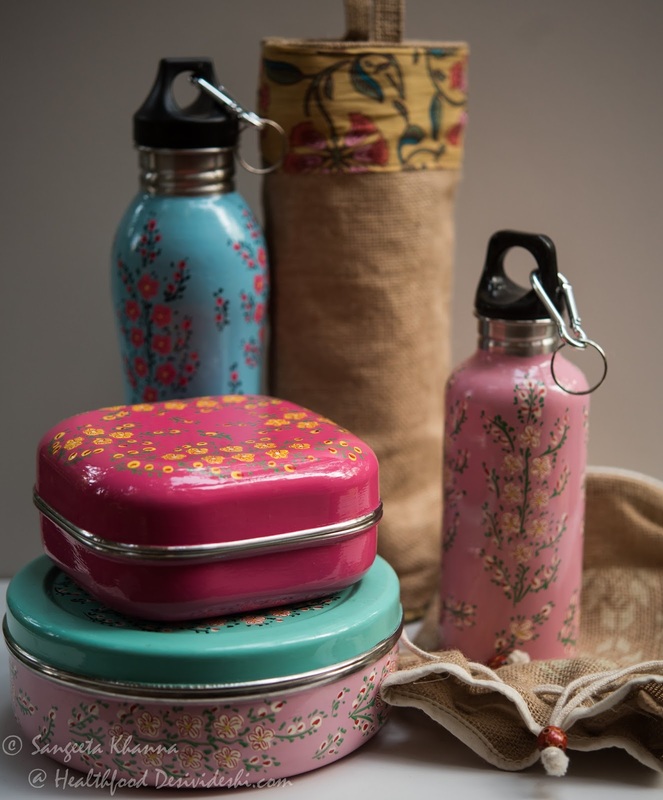 I Love the hand painted lunch boxes and water bottles. Gorgeous! Ah, beautiful lunch boxes and wonderful info. I have never had a need for tiffin boxes after school but I do think that one should carry stuff as much as possible to avoid temptation to eat samosas, patties and cup cakes. I remember my amma packing food in steel tiffins which were quite sturdy and no spillovers. Lookin for more such informative posts.